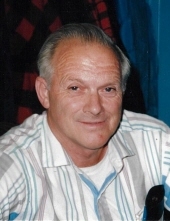 GARLAND-Archie Gilbert Chadbourne, 85, died surrounded by his family on Tuesday, January 29th, 2019, at Dexter Health Care. He was born in Harmony on August 11, 1933. It was in Harmony that he met and wed a red-haired beauty, Jackqueline Iris Howell, also of Harmony in a marriage that lasted 61 years until her death four years ago. A short time after their marriage, they moved to Texas where the first of their nine children was born on his birthday. Later on, child number five landed on his birthday as well—so it was a triple celebration. He was hardworking and took pride in all the work he did. He worked as a hand sewer, and his skills made him a much sought after sample sewer at a time when shoe shops were everywhere and a job could be had at the drop of a hat. However, he much preferred working in the woods. His knowledge of trees was extensive, and he considered wallowing in the deep snow, in the frigid cold as part of a job that let him be outside. He often would comment on how blue the sky was, or seemed to appreciate the green of each spring as if it was a new event that he was experiencing for the first time. Fall was his favorite time of year and the year before he died insisted that it was the most beautiful fall he had ever seen. He loved watching the birds at his feeder, hunting, fishing, and tree top flying with his pilot friend Leroy and his pilot daughter Sandra. Archie most enjoyed his walks if he could find a few deer tracks along the way. In spite of working in the early days of chainsaws when they were incredibly loud, with no ear protection, he still had excellent hearing until his death, along with the 20/20 vision that assisted him in spotting deer in the backs of fields. Whenever he left Maine he always remarked about how happy he was to cross the Kittery Bridge back home. He was part of a generation where your word or a handshake finalized agreements more strongly than any legal document. Archie loved his family and is survived by daughters, Debra Kantor and husband Mark of Hartland, Sandra Bush and husband Joe of Tucson, AZ, Kathy Spano and husband Joe of Sierra Vista, AZ, Rebecca Chadbourne of NY, Rachel Harmon and husband Tim of Dover-Foxcroft; sons, Steven Chadbourne of Lewiston, Paul Chadbourne and wife Laurie of Bangor, and Joe Chadbourne and wife Emily of Sangerville; brother Robert and Roberta Chadbourne; seven grandchildren; many great-grandchildren; and nieces and nephews. Archie is predeceased by his son David Keith Chadbourne; wife Jackqueline Howell Chadbourne; parents Merle and Berle Chadbourne; brothers and spouses, Clarence Libby and wife Julia Libby, Willard and Una Chadbourne, Warren and Christine Chadbourne, Wingate and Louise Chadbourne, Ivan and Joan Chadbourne and Arthur Chadbourne; sisters and spouses Madeline and George Corey, Mildred and Charles Deering, Arrita and Howard Annis, Irene and Clarence McKay and Florence and Louis Sinclair. In lieu of flowers, friends wishing may make donations in Archie’s memory to a charity of their choice. The family will receive friends form 1-2 p.m., with a funeral service immediately following at 2 p.m., Sunday, February 3, at the Shorey-Nichols Funeral Home, 191 Hartland Avenue, Pittsfield, with the Rev. Bob Young officiating. The family welcomes visitors following the funeral at the home of Debra Kantor, 510 Fuller Corner Road, in Hartland. A committal service with military honors will take place in the spring at Sugar Hill Cemetery in Harmony. To send flowers or a remembrance gift to the family of Archie G. Chadbourne, please visit our Tribute Store. "Email Address" would like to share the life celebration of Archie G. Chadbourne. Click on the "link" to go to share a favorite memory or leave a condolence message for the family.